Here’re some wall cladding ideas for you to add a contemporary touch to your home decor. It also makes practical sense; be it putting up a robust or washable surface behind stoves, sinks and around the bath. With different materials, you give your wall an added dimension that invites touch and reflects light in different and intriguing ways. Wood is a classic cladding material. Some wall cladding ideas include using readily available tongue-and-grooved boards painted or left natural with matt varnish to seal the timber. 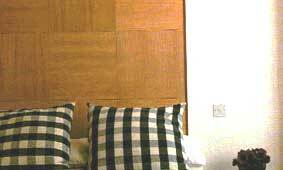 Large wooden panels can be screwed in place and trimmed with flat moulding to make a grid effect. Flush plywood sheets or thin wood veneer at the head of a bed will create a warm sense of enclosure for a sleeping space. The white, textural bedroom above shows elegant wood cladding at the headboard. Square panels of hardwood have been laid so that the grains mismatch, to provide varied wood tones. A thin lip of darker wood forms the edging. Wood paneling can be warming and give the effect of enclosure if dark woods are used. 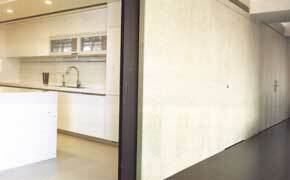 The pictures below show how teak wood paneling is extended to sliding doors to create a hidden room. 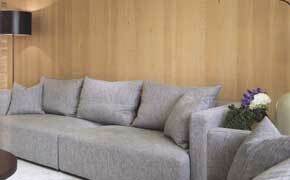 With lighter woods, such as light oak, bleached teak, elm or maple, it tends to be refreshing. The picture below illustrates how light oak is used, forming a seamless wall when the door in same material is closed. The example below shows dark wood cladding with white painted walls above. 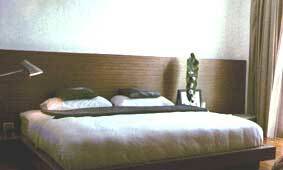 Since the wood cladding matches the bedroom furnishing, the bed looks contemporary, cocooned and inviting. Paneling is generally symmetrical and adds to the order of a room. With imagination, it may become the main feature, change character seasonally with time or even daily with light. For example, wavy timber panels spray-painted in metallic grey and spotlighted with pools of shadow and light. Another interesting example is shown below. Here, the designer used lengths of picture frame materials and joined them to form a tall panel headboard. Textured gray paint gives the rippling surface the appearance of sculptured stone – a dazzling and inexpensive idea. 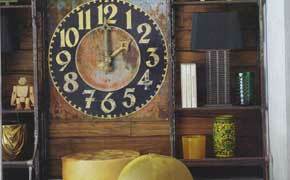 You may also want to salvage discarded furnishings to make your dream feature wall. This may be achieved by taking interesting cuts of spindles, carved sections of a table leg or any parts from badly weathered furnitures and glueing to them to the wall. Upon mounting the entire wall, coat the feature wall with a rich mix of black and silver metallic paint. This requires careful configuration so you may hide unsightly construction details such as wiring. Note only are you able to get the pieces at a steal (they're discarded afterall! ), you also do your bit for the environment by breathing new life into old furnishing. Try using materials that have a tough, industrial edge for splashbacks and bathroom surfaces. Pliable zinc or copper sheeting can be nailed, stuck or screwed on to walls for a gleaming, reflective surface. Rubbing down with wire wool and subsequent waxing will give a burnish to the metal. Bear in mind that with metal sheets, you’ll need the help of a electrician to earth this material. If you’re willing to stretch your imagination, other unique materials like copper and leather can be incorporated to your wall decor ideas. Take leather for example, it can be stitched and upholstered onto the walls. Fabric-covered walls are often a way to “warm-up” a room and add a new dimension to furniture, since they have a relationship with upholstery. The fabric may be stretched onto frames before being applied to walls in panels, the French way or pasted on directly. Fabrics which can be used range from hessian to linen and even silk – so long as they have good texture or slub. You may also look to textile wallpaper to achieve this look. The picture above right shows how suede-covered, handle-less doors double as feature panels. The grooved edges allow them to be opened from the side. The humble coconut husk can also be used to dramatic effect. It can be cross-weaved to double as headboard panel and wall decoration to tie in with lush surroundings. If you’re willing to stretch your imagination, other unique materials like leather can be incorporated to your wall decor ideas. Leather for example, can be stitched and upholstered onto the walls. Click on highlighted text to return to the top of wall cladding ideas.